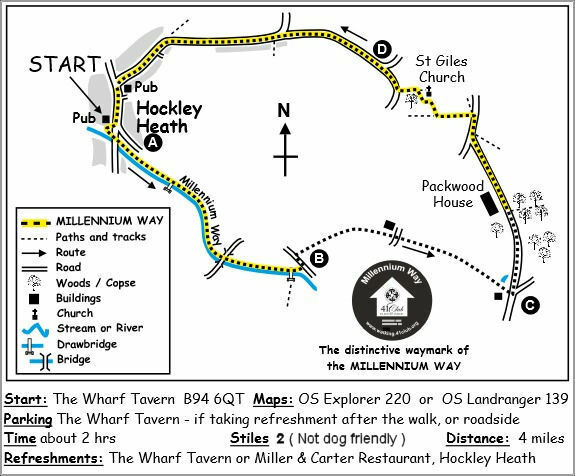 Starting from the Wharf Tavern in Hockley Heath, make your way through the pub car park to find a bridge left leading to the canal. You are now on The Millennium Way. Go left under the bridge along towpath keeping the canal on your right. Pass a drawbridge (Number 26), staying ahead to go under road bridge (Number 27) - there is an attractive picnic table in a few yards here, on the towpath - and eventually reaching a second drawbridge (Number 28). Here we exit The Millennium Way for a short while, leaving the canal towpath by turning left down a short wide track to the road. Turn left on road until you reach Packwood House where we have now rejoined The Millennium Way. 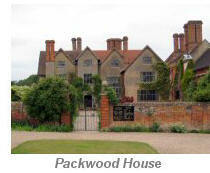 Continue past Packwood House along the lane for approximately 1/4 mile passing Grove Lane which enters from the left. After a further 100 paces take the kissing gate left into field following the black Millennium Way waymarker to go over centre of field to kissing gate under power lines. From this kissing gate go ahead with hedge left for approx 40 paces then follow waymarker to go half right to power pole in corner by trees to take kissing gate leading into churchyard of St. Giles Church. Face front door of church then go L on pathway to exit churchyard via gate to car park. Go left here along church access driveway to reach the road. Turn right at road and continue along to the T-junction. 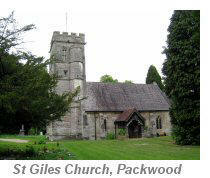 (The earliest record of Packwood, southeast of Solihull, is in a deed dated 1190 witnessed by Walter, chaplain of Packwood, and is evidence that there was priest and no doubt a church. 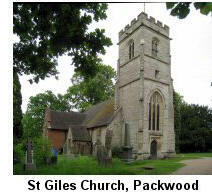 The present church of St Giles dates from the latter part of the 13th century (1270-80) and stands secluded and peaceful in fields, with Church Farm and Packwood Hall as its nearest neighbours. It was at St Giles' church on a June morning in 1706 that a Lichfield bookseller, Michael Johnson, came to marry Sara Ford. Their son, born in 1709, grew up to become Dr Samuel Johnson of literary fame. The registers actually date back to 1668 and are kept in the church safe). Go left at T-junction and continue on to meet main road. Go ahead on main road signposted Hockley Heath following road round to meet the main Stratford Road. Turn left here to walk along main road arriving back at The Wharf Tavern on your right. 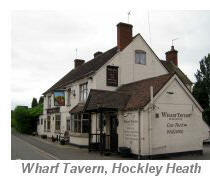 Built in 1849, the pub served the coal barges that pulled up at the local wharf. The back garden of the pub was the coalyard. A local story is that someone committed suicide by shooting themselves in the pub cellar in the 1960’s! The house began as a modest timber-framed farmhouse constructed for John Fetherston between 1556 and 1560. Its interiors were extensively restored between the First and Second World Wars by Graham Baron Ash to create a fascinating 20th-century evocation of domestic Tudor architecture. Packwood House contains a fine collection of 16th-century textiles and furniture, and the gardens have renowned herbaceous borders. The famous Yew Garden containing over 100 trees was laid out in the mid-17th century by John Fetherston, the lawyer. 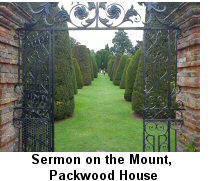 The clipped yews are supposed to represent "The Sermon on the Mount". In 1941, Ash donated the house and gardens to the National Trust. This is a most interesting church with some fascinating stories. 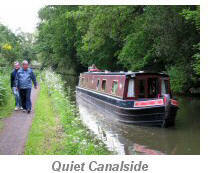 More details can be found on the ‘points of interest’ page for circular walk Packwood. Packwood Hall to the west of the church is largely a modern building, facing west, but retains an east wing of 17th-century timber-framing. The village was formed as a horse changing point on the 25 mile journey between Birmingham and Stratford-upon-Avon. A public house called "The Nag's Head" stands in the place where the stables are thought to have once stood.